The Caretaker Committee Chairman of the Peoples Democratic Party, Senator Ahmed Makarfi, has told former Vice President, Atiku Abubakar that there were people bent on destroying the party. 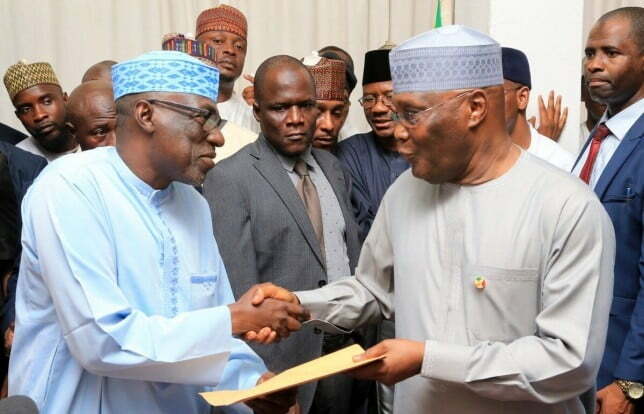 Makarfi spoke when he received Atiku at the party’s Secretariat on Tuesday in Abuja. The former VP had resigned from the ruling All Progressives Congress, APC, before officially returning to the PDP at the weekend. Makarfi, who was flanked by other members of the caretaker committee, said, “[We went through] guerrilla warfare, artillery attacks, bombardment, but we weathered the storm. And the story will be a positive one at the end of the day. “Your Excellency, you have opened the floodgates and we expect many more high profile returnees and new entrants into the PDP. The former Kaduna State Governor further denied that the party had a secret deal with Atiku before he agreed to return to the party. He asked Atiku to help the party develop a winning strategy that would enable it win the presidential election in 2019. He added, “We will continue to consult you.Theu will also help us reinvent the vehicle that will take us to Aso Rock in 2019. “We are not just targeting Aso Rock, we are targeting the federal legislature, the states, both the executive and the legislature . We are targeting the local governments.